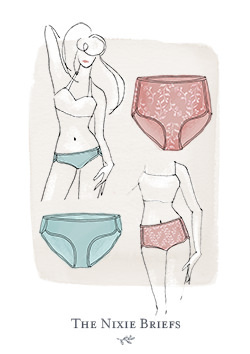 All Patterns Now Available in A0 Print Shop Format! 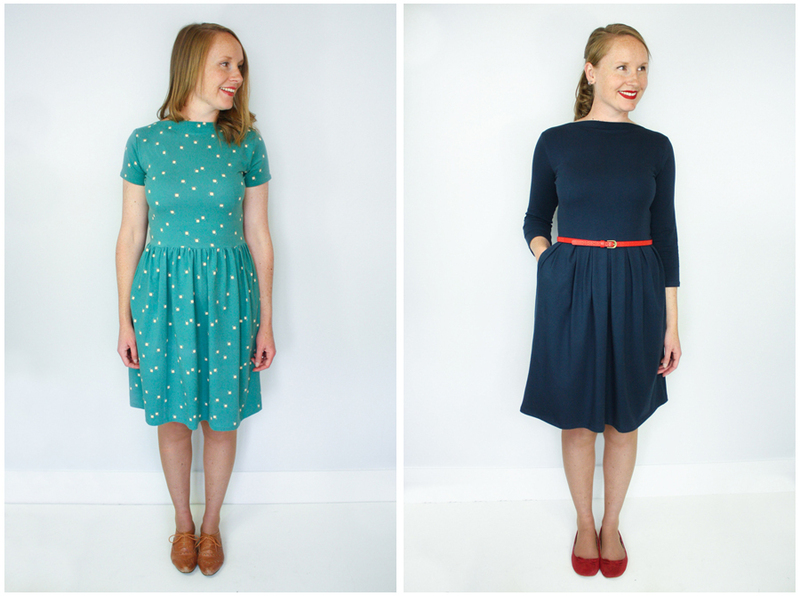 All patterns are now available in A0 Print Shop format, yay! 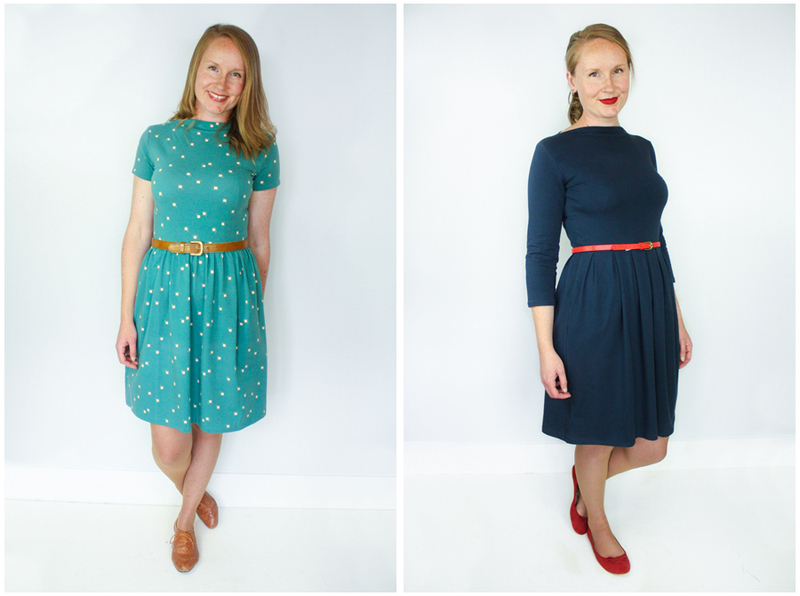 If you purchased a pattern from me during January, you should already have the new format in your chosen design, however, if you purchased earlier than that, you won't. 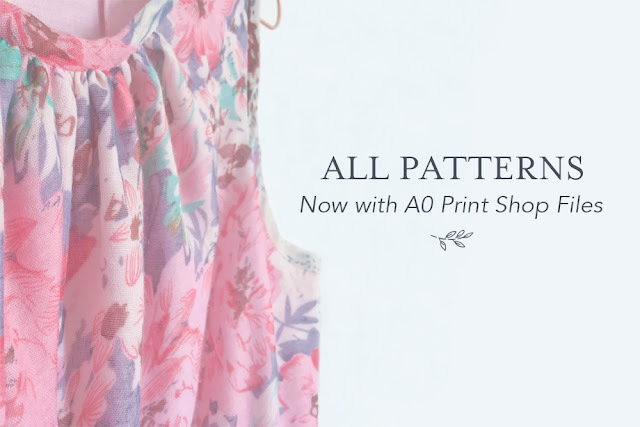 SO, if you'd like the A0 Print Shop format of your pattern(s) please forward your receipt (either your JLH, Etsy or Paypal receipts) to jen at jenniferlaurenhandmade dot com and I'll forward you the relevant files. Please note - I'm expecting a huge number of requests, so it may take a few days to receive your file. If you don't hear from me within a week of emailing, please email again, just in case!! 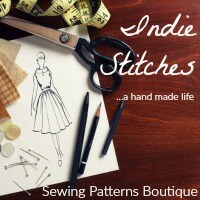 One of the things I most love about sewing is the ability to make what ever you want. You can make things that never existed before. 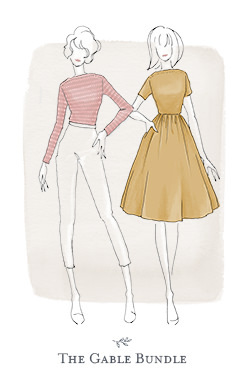 You can re-imagine loved garments. You can mould the rules to suit different fabrics and shapes. 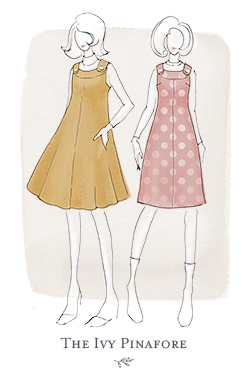 You can extend the life of loved sewing patterns. 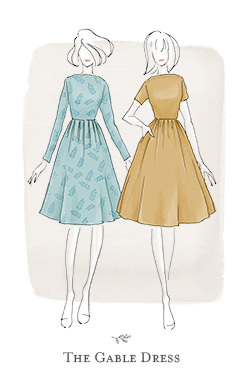 With pleated and gathered skirt options, The Gable Dress Expansion Pack includes new bodice, pocket and skirt pattern pieces, making this one of the most versatile patterns in your stash. 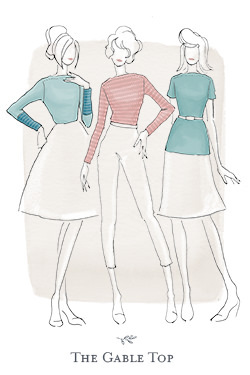 Use any of your three original Gable Top sleeve patterns (or this tutorial for 3/4 or bracelet length sleeves) and you'll have tops and dresses sorted from spring to winter. 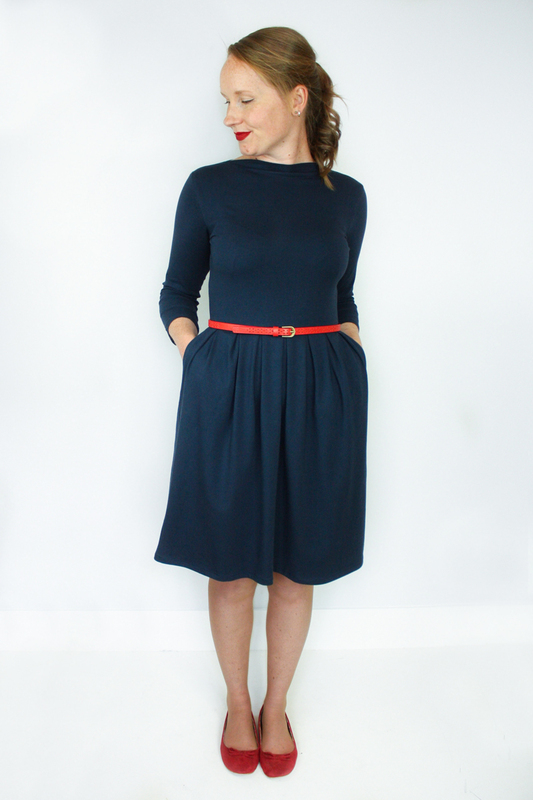 Keeping the original classic 50s-inspired slash neckline and comfortable knit fabric construction, The Gable Dress is the perfect quick make. 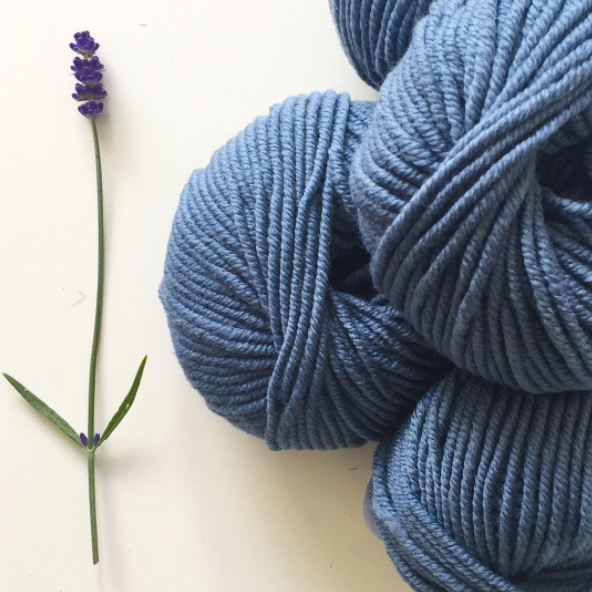 It can be made up using any of the recommended fabrics from your original Gable Top pattern — from cotton lycra to snuggly merino knit, the choice is yours. 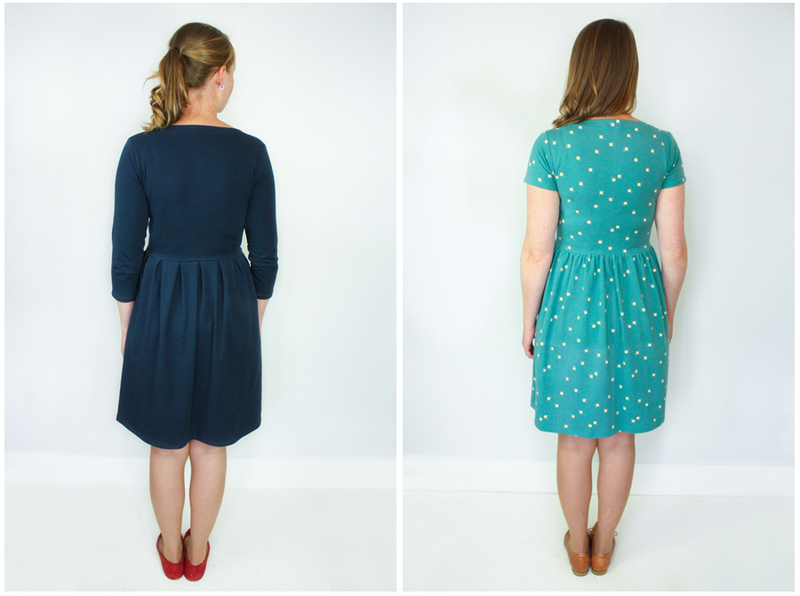 The Gable Dress Expansion Pack is now available from my shop for just $3.50. It includes my recently introduced A0 Print Shop files as well as the standard A4 Letter files. 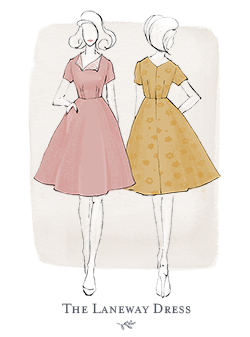 You will receive all new bodice, skirt and pocket pieces as well as detailed instructions on how to construct the dress. This is an expansion pack though, so you will need your Gable Top pattern to complete the dress! If you haven't already purchased Gable, not to worry. You can purchase The Gable Bundle, which includes the original Gable Top and the new Gable Dress Expansion Pack. 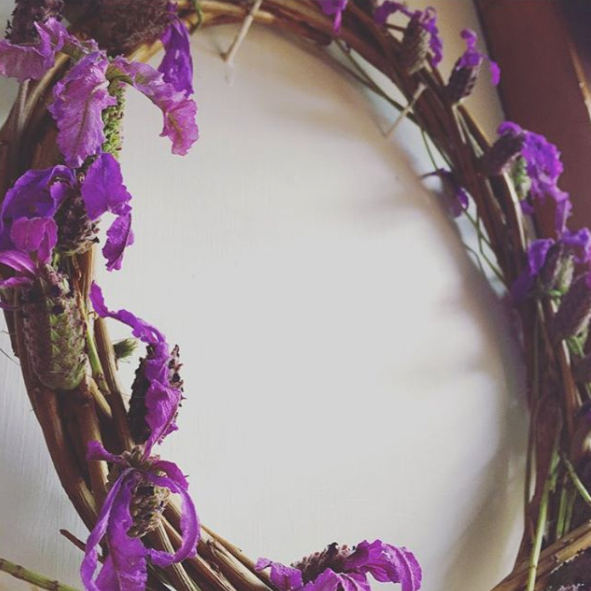 Usually $14.50 when purchased separately, you can buy them in bundle form for just $14. 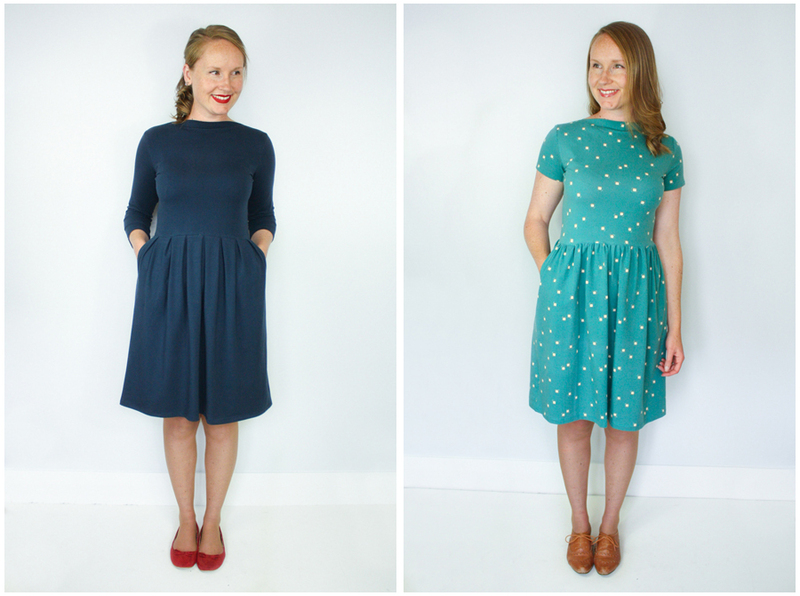 I'd love to see your Gable Dresses, so why not share them with me by either tagging me directly, or using the hashtag #GableDress. 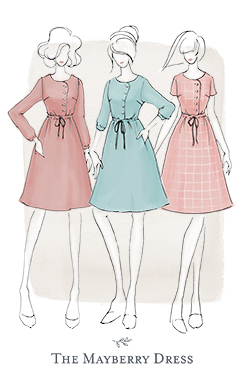 ps) If you'd ever like to be the first to find out about new patterns AND receive the exclusive subscriber-only discount when they're released, make sure you sign up to the newsletter! 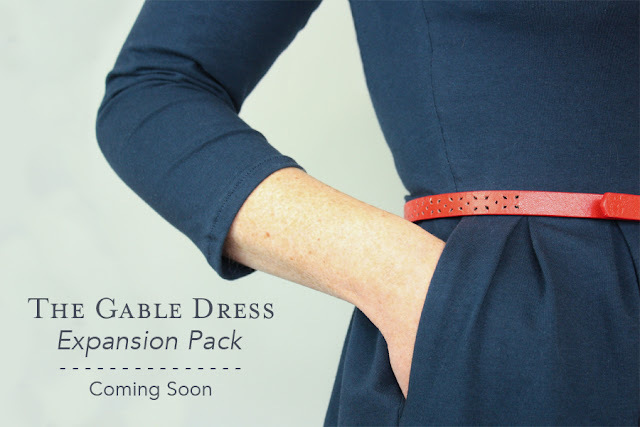 I'm sure it's quite easy from my 'sneak peek' above to guess what one of the views for the new Gable Dress Expansion Pack is (pleats and pockets, oh my!). 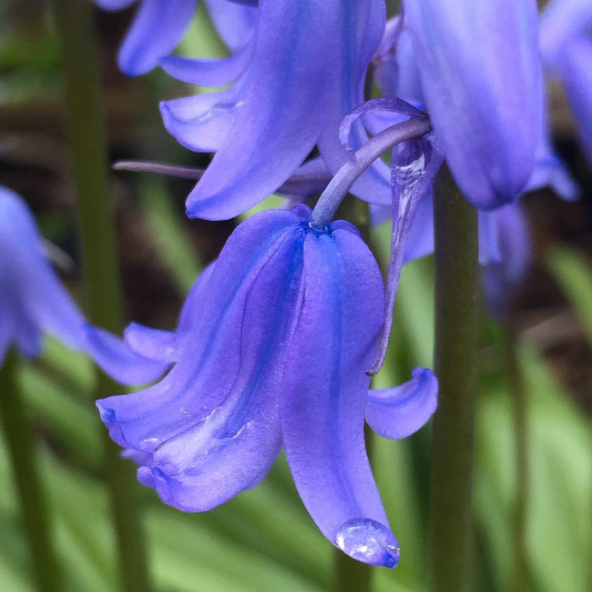 But, if you'd like to be the first to know when it's available and take advantage of the subscriber-only discount, then why not sign up to the newsletter? 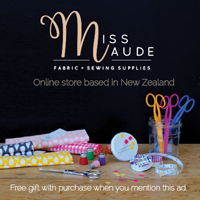 You'll need to sign up by 8pm on Monday 23rd January NZDT to make sure you're on the list. 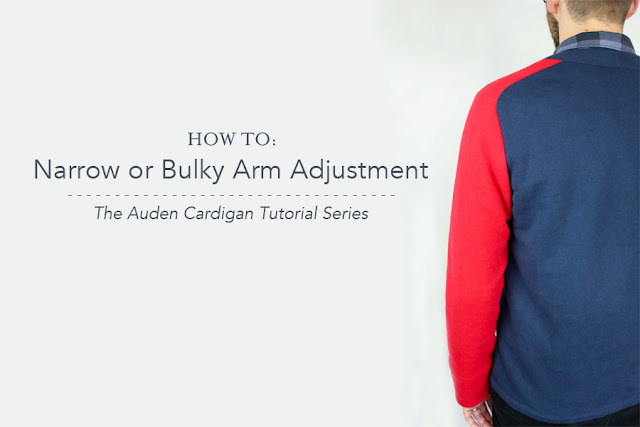 Another simple adjustment you can make to The Auden Cardigan for a more personalised fit is to adjust the sleeve for narrow or bulky arms. 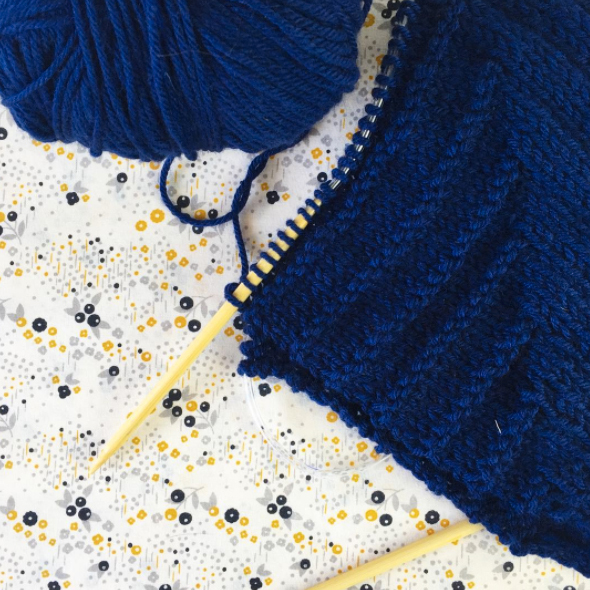 The sleeve on Auden is lightly shaped, but sometimes you need more shaping and sometimes you need less, depending on the person the cardigan is being made for and what you're planning to wear underneath. 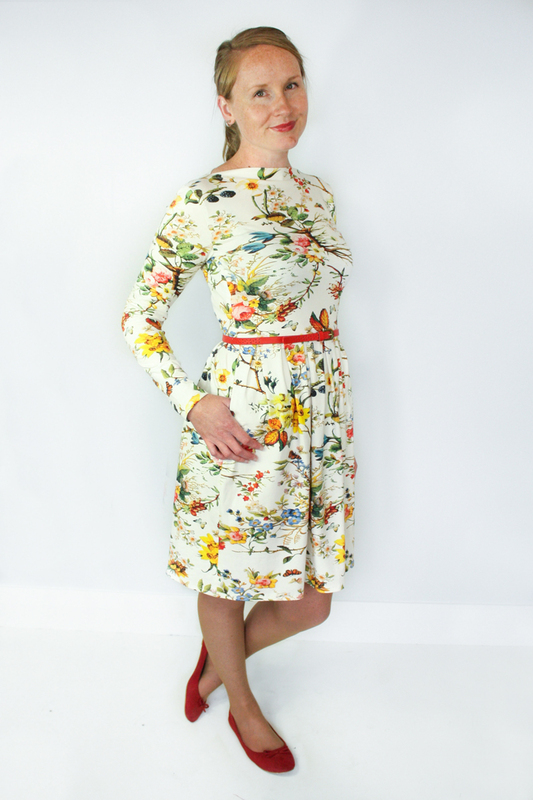 Note - These alterations should be made without a seam allowance and after a muslin has been made so that you can get a gauge on how much you need to adjust your sleeve by. 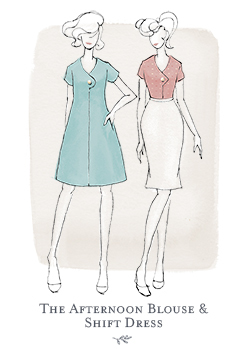 A narrow arm adjustment removes excess sleeve width, resulting in a slimmer fit sleeve over all. Using the diagram above, pinch out any excess from the bottom of the sleeve up to where the bicep sits at the top of the sleeve. 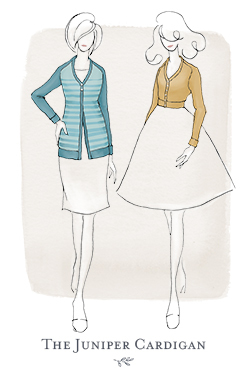 Note - make sure you're wearing what you will most likely wear underneath your cardigan to make sure you aren't taking out too much. 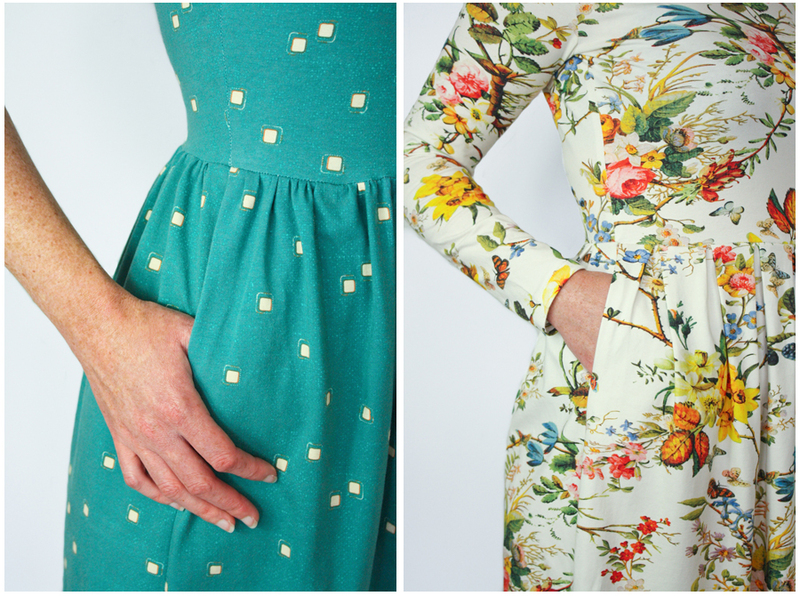 Dividing your excess up evenly on both sides of the sleeve, transfer these new points onto your sleeve pattern, then draw a gentle inward curve from your wrist up to the underarm of your sleeve. 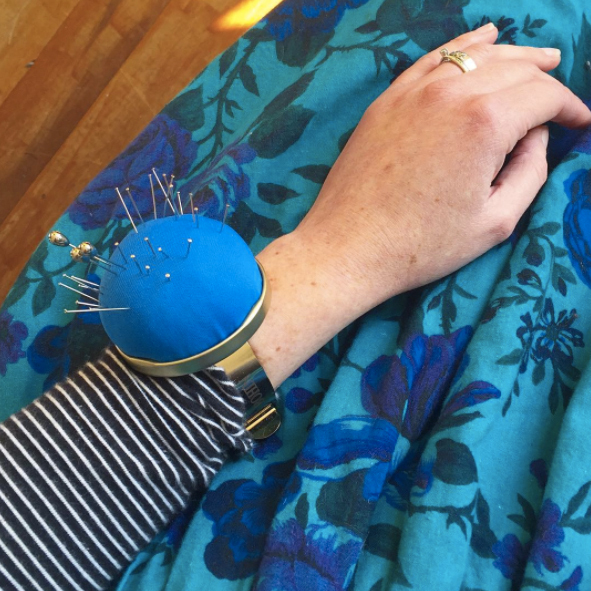 Adjust your cuff to match your new sleeve wrist width. A bulky arm adjustment adds width to the sleeve to accomodate a wider arm. 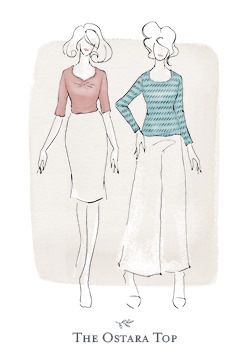 Wear what you plan to wear underneath your cardigan and using the diagram above, measure the wrist and bicep, making sure to take into account wearing ease. Place your pattern onto scrap paper and adding width evenly on both sides of the sleeve, transfer your new markings. 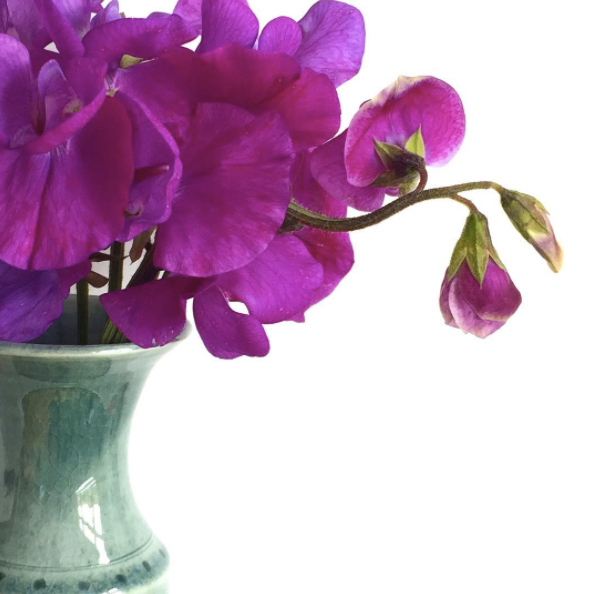 Draw a gentle outward curve from your wrist up to the underarm of your sleeve. 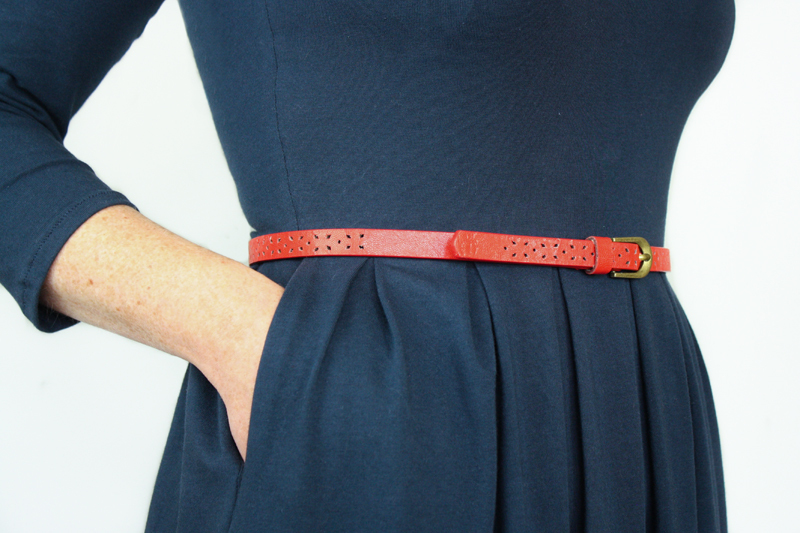 Adjust your cuff to match your new sleeve wrist width. 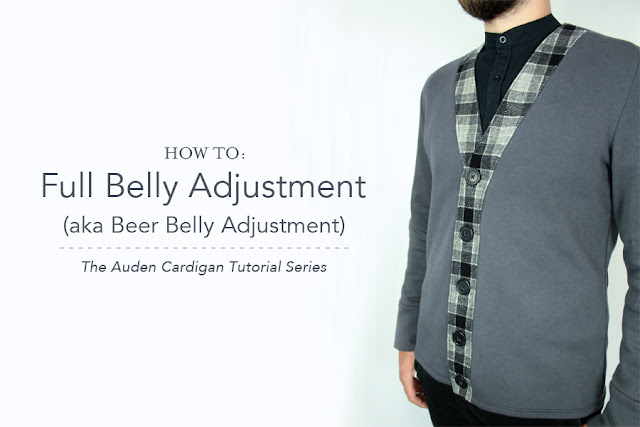 These are simple but effective adjustments to make to your Auden Cardigan (or any long sleeve pattern for that matter). 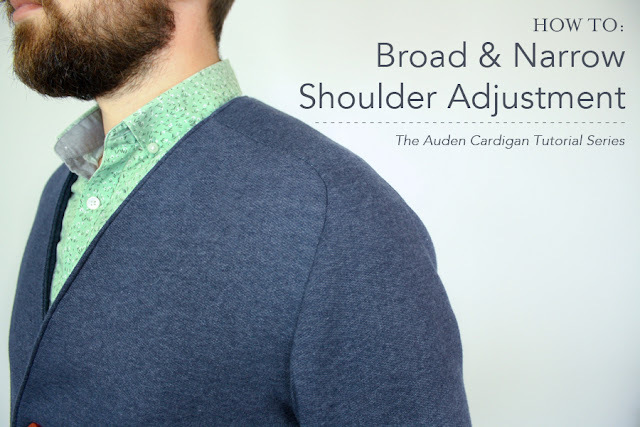 Today I'm going to be taking you through how to adjust the shoulder line on the Auden Cardigan for broad or narrow shoulders. 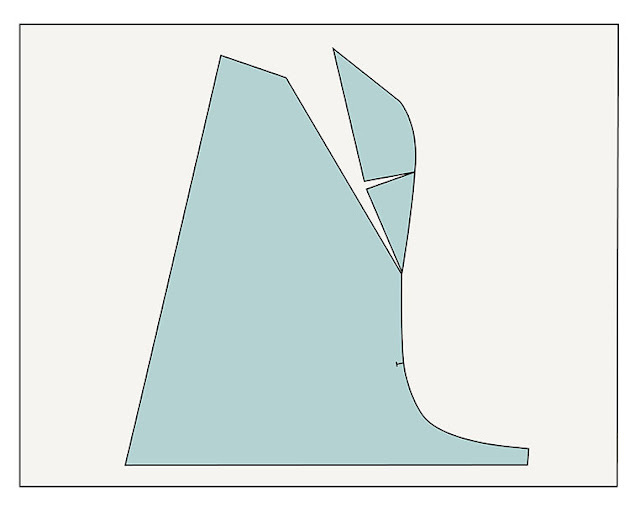 Because of the saddle shoulder detail, it probably looks more difficult to make these adjustments than it actually is. Really, they're just as easy to do as they are for normal shoulders, they just have slightly different steps, but it's the same principle. 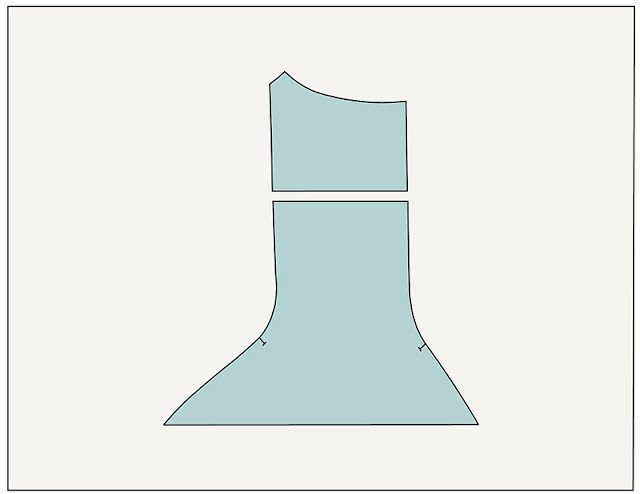 In the tutorial, I've just shown the front pattern piece, but the same adjustments will need to be made to the back pattern piece as well. Also, I mention this below but thought I'd point it out at the start too that you shouldn't over do these adjustments. If you do, you could not only significantly distort the design lines of the cardigan, but you could also end up making the overall fit worse. 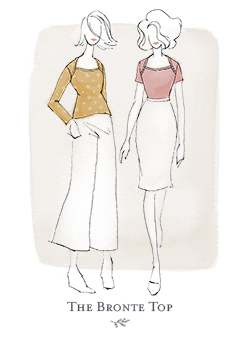 If you have significant broad or narrow shoulders that you're adjusting for, I would suggest grading a half or full size in the shoulder area on the front, back and arm pieces, rather than risk completely changing the look/fit of the cardigan. 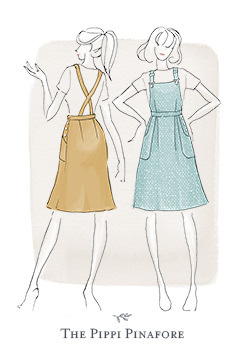 You should always make a muslin first to determine any fit issues. If a broad/narrow shoulder is required, measure your shoulder line to determine by how much you should adjust the shoulder on the pattern. Right, let's make some shoulder adjustments! 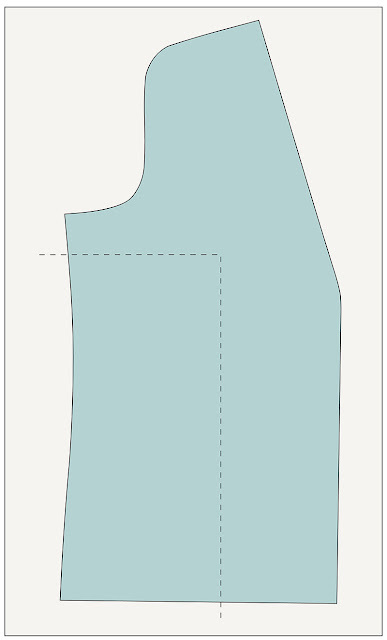 Note - All pattern adjustments should be made without the seam allowance included on the pattern. 1. On your Front Body pattern piece, draw a straight line from the middle of the top 'straight' section of your shoulder line, down through to roughly the middle of the two notches on your armscye. Cut along this line leaving a pivot point at the circle marked below. 2. 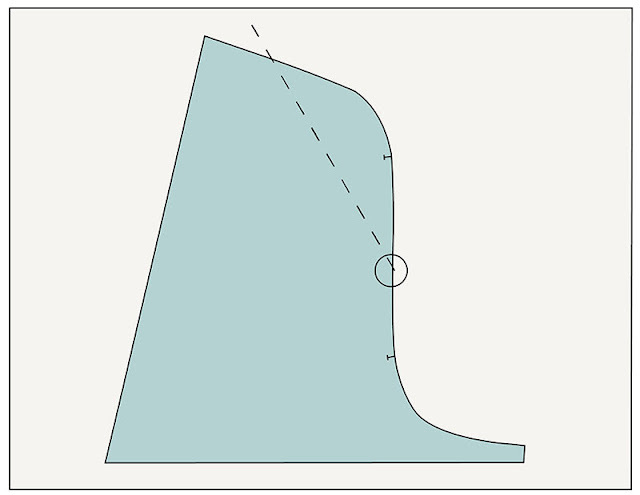 Draw in a second line, 90 degrees from your first line, up to the top notch on the armscye. Cut along this line, leaving a pivot point at the notch circled below. 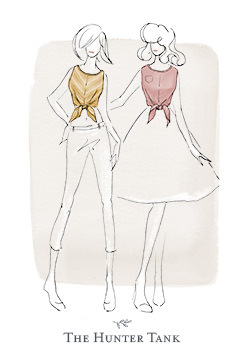 This adjustment adds length and height to your shoulder to accomodate the extra fullness a broad shoulder requires. This is probably the most common type of adjustment you'll need to make. 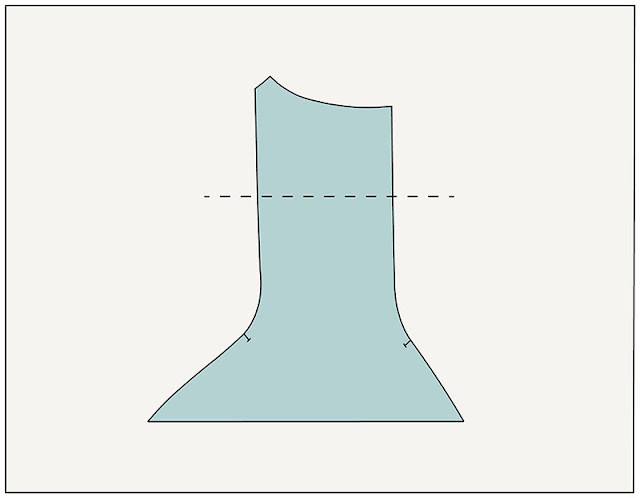 A word of caution though, don't over do it, as you could end up changing the angles too much, resulting in weird design lines and a poorer/baggier fit around the shoulders. 1. 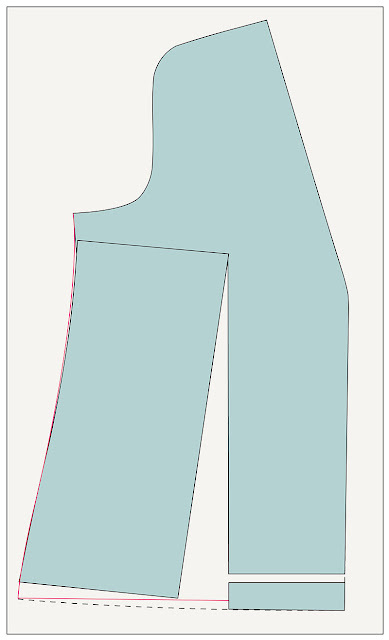 Add scrap paper to the bottom of your pattern then pivot your shoulder line out by your required amount, keeping the top of your shoulder in line as much as possible. Tape down then true up your shoulder line. 2. Adjust your sleeve shoulder piece by cutting along the straight section, popping some paper underneath and spreading by the same amount you increased your shoulder line by. Tape in place and true up seams. This adjustment removes length and height from your shoulder to accomodate a smaller shoulder. The narrow shoulder adjustment doesn't tend to be as common as the broad shoulder adjustment on mens clothing, and you more than likely won't be taking out as much for a narrow shoulder as you would add for a broad shoulder. 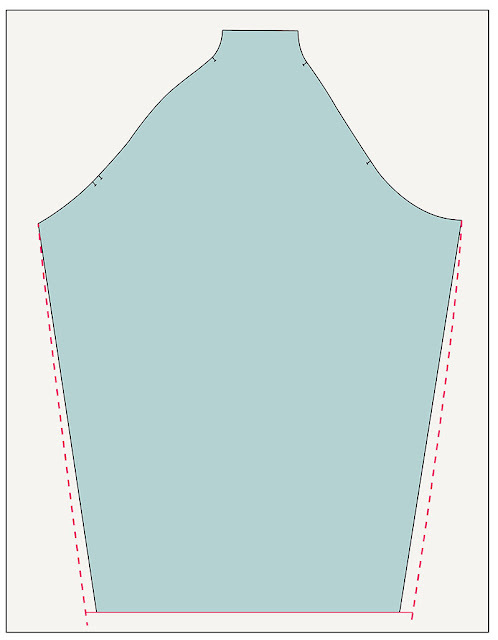 Don't over do this adjustment though, as you could alter the fit around the shoulder making it overly short and tight and leaving you with weird design lines. 1. Add scrap paper to the bottom of your pattern then pivot your shoulder line in by your required amount, keeping the top of your shoulder in line as much as possible. Tape down then true up your shoulder line. 2. 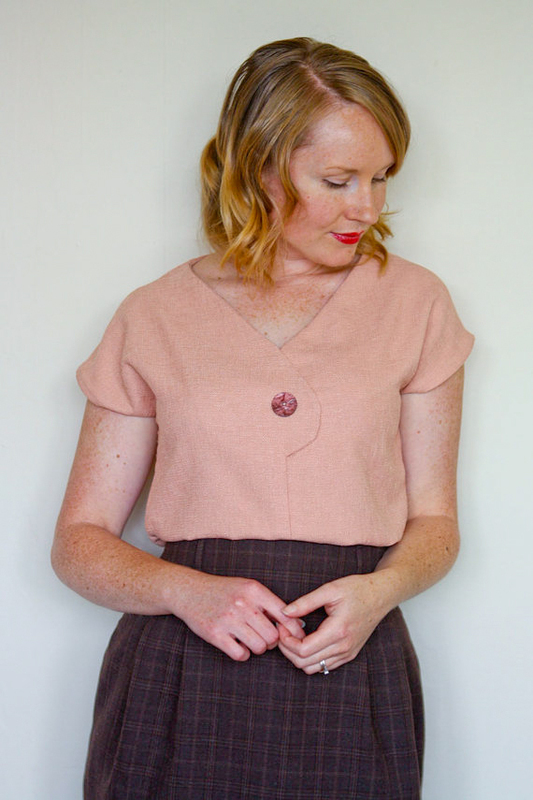 Adjust your sleeve shoulder piece by cutting along the straight section, and bringing the two pieces together by the same amount you narrowed your shoulder line by. Tape in place and true up seams. 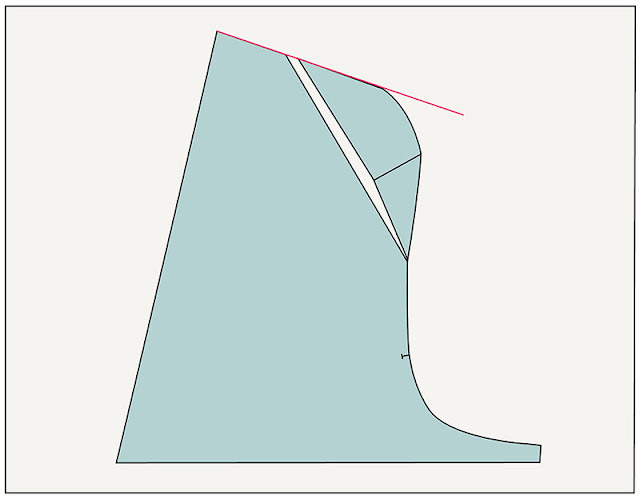 And that is how you adjust the fit of the shoulder on a saddle style. Easier than you thought, huh? 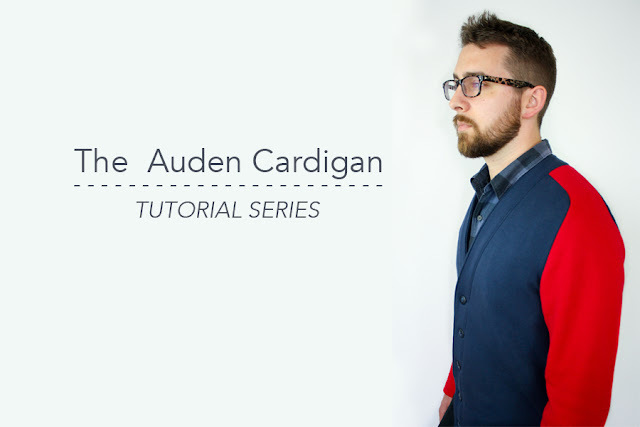 At the end of last year, I released my very first men's wear pattern, The Auden Cardigan, and this month, I'm going to be taking you through a few common fit adjustments that you may need to tackle depending on who the cardigan is for. Auden is a deceptively straight forward make, but I know that men's patterns can seem daunting if you've never made one before, especially one with a saddle shoulder. From my experience, they're actually easier (there's no bust to fit! ), there's just a bit more fabric to deal with. Let me know if there is something you'd like to see that isn't listed, otherwise I'll see you with the first tutorial next week! I hope you had a good one, however you chose to spend it (I did some knitting, drank some wine & watched The Crown before going to bed around 11pm and sleeping right through. We like to par-tay in this house, obviously...). I'm still trying to find my energy for the new year though I have to be honest. I feel... bitty. Like there are too many bits and pieces to do and like I'm doing a little bit of all of them and not a lot else. I went back and read my first post for 2016 a few days before the 1st and had completely forgotten that I had a word for the year. That word was Focus, and although I promptly forgot my word a few months into the year, it did actually put me on the right track to get s**t done. And, yes, although I forgot about my word for the year, as I was reading back, I found that I still really loved the concept of it and so started to think about a word for 2017. I ran through a few words but kept coming back to the feeling that I still wasn't done with 'Focus' yet. Focus all on it's own however, just seems a bit too broad for what I feel like I need for 2017. This year, I need more defined, intentional focus. 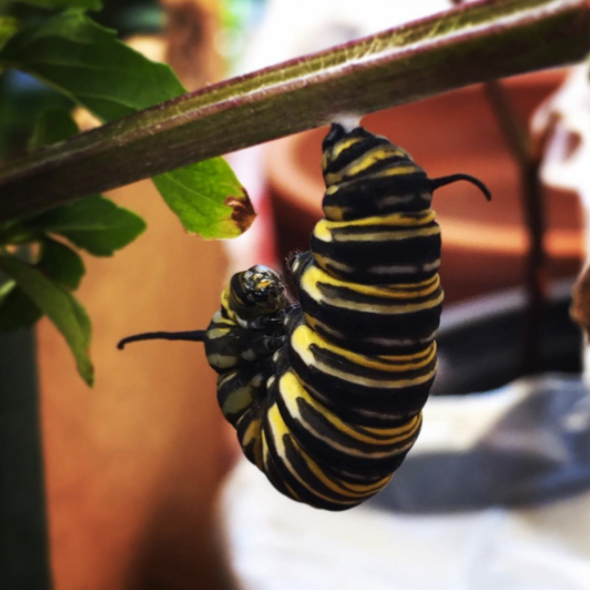 Not just random pick-a-project focus, which is what I feel like 2016 was. Yes, I got stuff done, but it was bitty. You know? As I look back on 2016, I realise that I didn't set myself up to work smarter during my work time - there was an overall plan, but there wasn't much of a daily To-Do list. 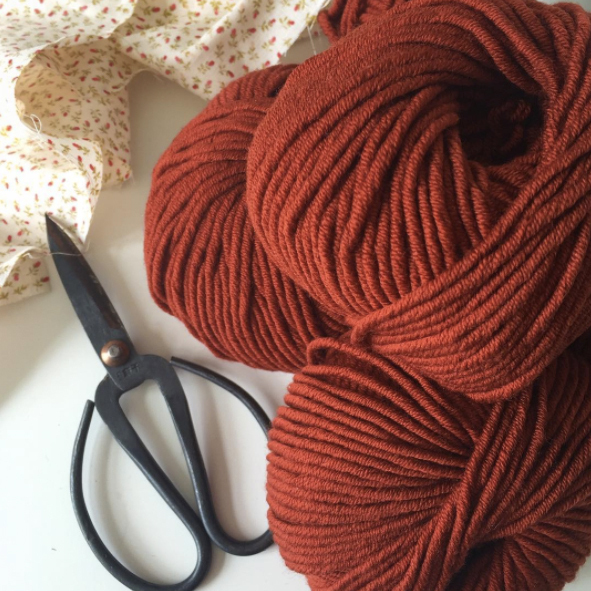 Also, when a project was complete, instead of tidying up to give myself a fresh space to work in, I'd plow on and find myself lifting up piles of fabric for my scissors, or spending ten minutes moving bits around so that I had a large enough space on my desk to draft. This year, my goal is to take at least one of my work sessions every fortnight-ish to clean and plan the next week or so, to hopefully gain back some much needed productive time. To focus intentionally. With that in mind, January is turning into a busy month for us. 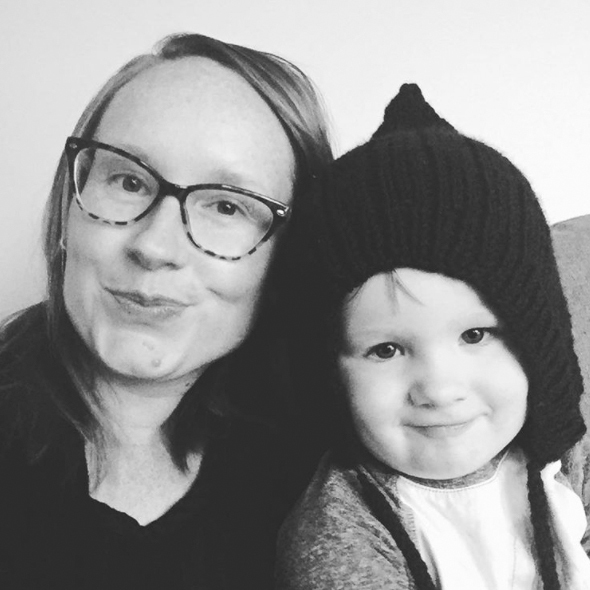 David and I are pretty 50/50 when it comes to looking after Oscar, we're fortunate enough to be in that situation (for the time being), and it's been to the benefit of all of us. This month and on into February though, is going to be a bit of a different situation with David being pretty much completely inundated with work. It means I'll be on almost full time Oscar-watch while also trying to squeeze in some work of my own (Auden Cardigan tutorials are going live, The Gable Dress Expansion Pack release will be here at the end of the month and getting The Juniper Cardigan ready for testing, are all things vying for my attention this month). My mum is visiting for a week in the middle somewhere and the garden appears to have entered into it's post-Christmas-New Year explosion. 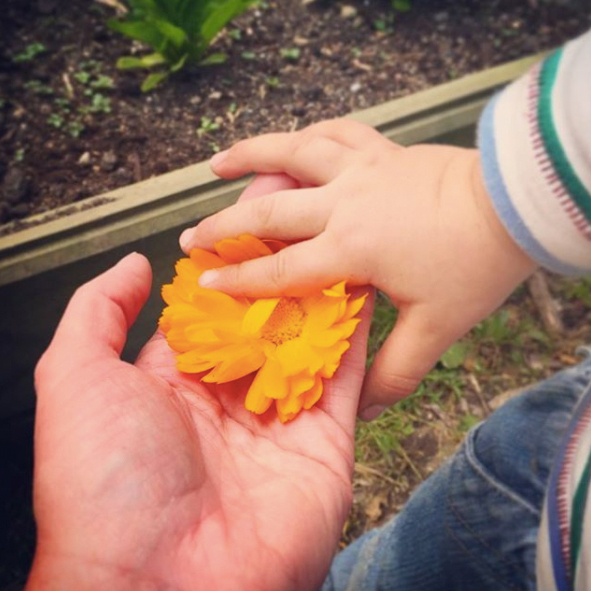 It's always a few days after Christmas when the flowers bloom, the veges pop and we can't keep up with it all. I also have lots of personal projects on the go that I desperately want to either finish or make a start on, many of which I talked about in my last podcast for 2016. So, it's all go round these parts. Not to mention that 2017 is shaping up to be interesting in many other ways than just my small part of it. Hug too much, Smile too much. And, when you can, love.